7 modules / 18 hours Our online programs are self-paced. On average, students take 18 hours to complete this course (+-3 hours per module). 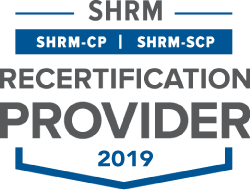 certificate + SHRM & HRCI Upon completion you will receive an official certificate of completion. The certificate id will enable you to add it to your LinkedIn profile. This course is eligible for 15 personal development credits with the HRCI and SHRM. By analyzing HR data you take the first step towards determining the impact of people-related policies on your organization’s bottom line. This entry-level course enables students to familiarize themselves with working on (HR) data using Microsoft Excel and Power BI. The HR Analyst course is specifically tailored for those people that have little or no experience in processing and analyzing data. You will learn to extract, merge, clean and analyze datasets. At the end of the course, you will have built your own custom dashboard in Power BI. Develop practical data analysis skills and start unlocking the full potential of your HR data. Whether you just want to become comfortable with working on HR data or have the ambition to become a real data scientist, this course offers the foundation you need. Its tutorial-style lessons enable you to gain hands-on experience, develop practical skills and apply those within your organization right away. "Excellent to get a solid understanding of the principles of workforce planning and analytics and how they fit in within a broader organizational framework. Everything is nicely linked to practical examples. The course is easy to do for everybody who has Excel installed on their computer. "The HR Analyst course was an excellent introduction to the role of an HR Analyst. We have just started to incorporate HR Analytics in our office and this course provided me with a solid understanding of the field. "Good and very solid beginner course in applied HR Analytics with a brought overview of concepts, metrics and KPI and basic introduction in data analytics in MS Excel and MS Power BI." General Manager HR & Corporate Services - Mallcom Ltd.
"I strongly recommend this course to anyone who wants to learn how Analytics can be introduced in your daily work in HR. This course paints a clear picture of the topics you usually aim to cover in Analytics and the requisite tools for the same, and how. "This course is a great introduction to HR Analytics. You learn a lot of key skills in Excel and PowerBI. Everything learned in this course will benefit you and your workplace"
Erik van Vulpen is the founder of Analytics in HR (AIHR). He is an expert in connecting HR processes to business results through qualitative and quantitative methods and globally recognized as one of the top thought leaders in the field. Erik is a regular speaker at conferences, he trained hundreds of HR leadership teams to apply data-driven HR and analytics in their organization. He also teaches at Utrecht University (The Netherlands) and graduated in Law, Psychology (hons.) and Business Administration (hons.). Throughout this course, you will work with Microsoft Excel and Microsoft Power BI. Microsoft Excel is part of the Microsoft Office suite and available for both Windows and Mac. Power BI is Microsoft’s data-visualization software. For this course, you will need to download and install the FREE desktop version of Power BI. Your instructor will show you how to download and install Power BI. Need advice on which course best fits your personal needs and career objectives? Our admissions advisors are here to help – schedule a free 15-minute call. Data is becoming an increasingly integral part of every aspect of HR. To be successful in today’s competitive market, all organizations need to learn how to leverage HR data to make better business decisions. The HR Data Analyst course offers the opportunity to gain hands-on experience working with HR data. You will develop practical skills that enable you to extract, combine, clean, and analyze HR data. By the end of this course, you will be ready to apply these skills in your job and start generating data insights to support the decision-making process. Furthermore, you will have built your own custom HR dashboard in Power BI. Do I need to buy Power BI? No, the Power BI desktop version that we use in this course is available for free. You’ll find instructions to download this free version, in the course. Which devices are supported by Power BI? You can use Power BI on all Window computers. While it is not possible to install it on a Mac, it is available on all tablets and smartphones (including Apple devices). Power BI is a powerful data-visualization tool and among the most mainstream ones in the field of HR Analytics. By choosing to add two extra modules on Power BI, we wanted to make sure that everyone would be able to build stunning dashboards on such tools at no additional cost. This course qualifies you for a wide array of HR analytics related roles such as HR (Data) Analyst, HRIS Analyst, HR Analytics Consultant. The data analysis skills that you will develop with this course offer a solid foundation to specialize further for roles such as HR Data Scientist or Strategic Workforce Planning Specialist. Can I preview the course and lessons? Yes! We have uploaded two lessons to our preview portal. In the syllabus, you will find the detailed curriculum overview. Are You Ready to Develop In-Demand Skills?